Charlotte, a recently divorced mother of two, decides to take a vacation of her own while her children are spending time with their father. She finds her way to Austenland, an immersive resort where visitors get to experience the genteel country life of Regency-period England. While Charlotte attempts to reinvent herself and make peace with being away from her children, she becomes entangled in the mystery of a potential murder. Are all the guests at Austenland what they seem? Do her kids even miss her? Was that really a dead body she saw upstairs? 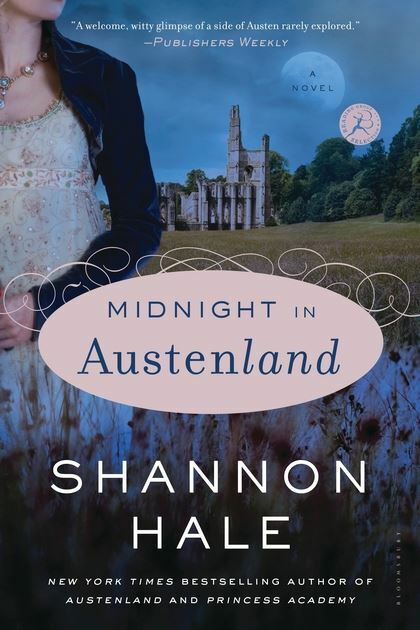 Midnight in Austenland is the second book set at the exclusive, fictional resort. (The first is called simply Austenland.) As you might guess from the title and murder mystery, this trip to Austenland plays with the plot of Northanger Abbey. Shannon Hale is deft at weaving in little details from that book. For example, when Charlotte blurts out "Oh, it's you!" upon meeting a famous guest, she covers by suggesting that perhaps they had met in Bath, like characters from Northanger Abbey. Later in the book, Charlotte does an admirable job of freaking herself out at night, especially after playing spooky 19th century games. Though thoroughly enjoyable, this sequel wasn't quite as amazing as the first installment. The dialogue wasn't quite as snappy as what I have become accustomed to from Shannon Hale. Some of the funny bits seemed forced, and the characters occasionally slipped into caricature. I remain, however, enamored of the whole concept of Austenland, and hold out hope that if Austenland can't be a real place, that at least someday there will be a third book in this lovable series.